Everything in Our Museum, promotes presence, and enlightenment! 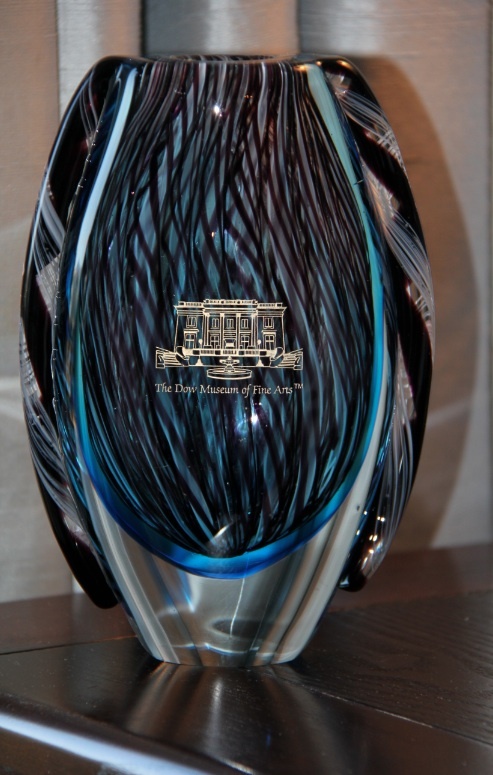 This beautiful art glass vase, is, romantic, modern, imaginative, and classically refined! This stunning art glass vase, makes an amazing gift, for, your most sophisticated loved ones; and a fine art collector’s, treasure! This is such a romantic and beautiful art glass vase, that seems to be, quietly telling, its own enchanting story! Just sit peacefully, as you gaze, at its breathtaking beauty! Notice the rich, exquisite colors, flowing gracefully; a dreamy movement, of willowy, vertical lines dancing, and delicate fine details following! Its poetry for the eyes! A song for your heart! A dance for your dreams! And food for your soul! Such a magical and prosperous gift, that will always bring an abundance of love, and joy, to the receiver! In our stunning photo, you can see why, this gorgeous vase, also, makes a great conversation piece! An art glass vase, with a presence; it appears astute and experienced, cultured and refined! The unique design of this art glass vase, is intelligent, graceful, poised, and imaginative! With its elegant shape, and, an air of enlightenment; it will remind you, to be present, and inspire your intuition! 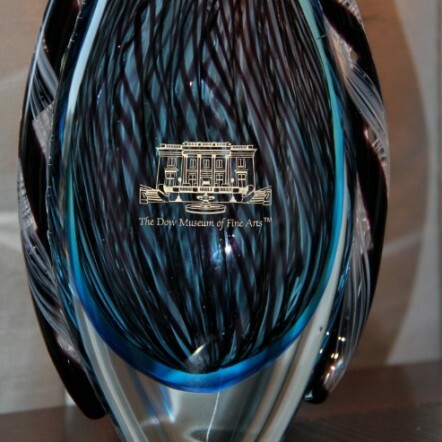 This exquisite, awe-inspiring art glass vase, looks amazing, in any room, you choose, to display it! It will definitely enhance your home, and/or, you may even choose to, enliven, your work environment! Admiring this incredibly sophisticated, and insightful looking piece, with such, magical romantic colors; evokes wisdom, enlightenment, and philosophy! The magnificent rich colors illuminate from every angle; which include, eggplant purples, violets, mauves, light blues, turquoises, and whites! A refined, and very poetic looking piece, that tells such a lovely, and enchanting story, to the viewer; encompassing romance, wisdom, knowledge, and understanding. Wisdom; is such refined beauty, that promotes divine presence. Being present is a way of life; surrounding yourself with beautiful things, raises your level of consciousness. “While we take the time, to admire, exquisitely beautiful things, we become more present; and internally, we become more beautiful”. So remember, to be present, and intentional; as you decide where, you would like to place, this refined, and romantic, art glass vase. You can create your own lighting color palette, using natural light coming from the windows, shining a small spotlight directly, even dimming your chandelier; or, just place it and let it “be”, this vase will be, an extraordinary focal point! Depending on, what time of the day it is, or how many windows or lamps, you may have in the room, you will admire the luminous spectrum of color variations, and the graceful, elegant swirling movement, of delicate vertical lines, dancing so romantically! These make such lovely and prosperous gifts, because, as you can see, they are so heavenly to gaze at! This magnificent piece, exuding such refined beauty and elegance, will always, remind you, to be present. We always like to inspire people, to be more present in their lives, and to their beautiful surroundings. Every time you look at it, you will feel, the deepest, heartfelt gratitude! We all, truly have, so much, to be thankful for! You will experience more gratitude, happiness, love, and precious moments of enlightenment, in your heart and soul! Wisdom, is such a special piece, that will be cherished, and passed on, for generations to come! Such astonishing beauty, reminds us all, how truly remarkable it is, to be fully present! It stands approximately: Height 8.500 in. x Width 5.750 in. x Bottom Diameter 2.063 in. and Weight 5.75 lb. (these measurements vary, due to the uniqueness of each piece; no two are exactly alike). It is a decorative piece; that is both, an art glass vase, and/or, an art glass sculpture. colors: eggplant purples, violet, mauve, light blues, turquoises, and white.